My name is April W. from Fort Worth TX. (I also made a coolest homemade Sally costume). 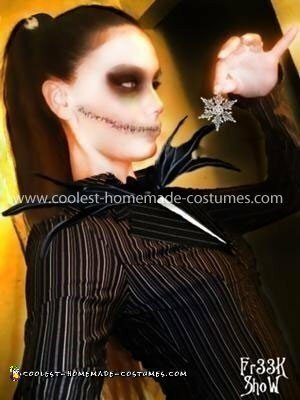 I bought the woman’s suit jacket from thrift town for my job as a telemarketer but never got to wear it until this picture of the Jack Skellington Woman Costume. I love Nightmare Before Christmas! and I LOVE your site! Homemade costume idea posted by April W.
OMG.. I absolutely LOVE this costume!! Love nightmare before Christmas! Could i please ask if you don’t mind, how you went about making the bow-tie?